It was great being a kid and growing up in the 1970's and early 1980's. I remember getting my first video game, “Pong” (You connected the unit to your TV). It was just two paddles and a ball moving across the screen. Although nothing spectacular today, it was revolutionary at the time, and a lot of fun. It was a great time to grow up! I remember how happy I was when my father bought me an Atari video game system. I shoveled snow, raked leaves and worked hard to buy the video games, one by one from Toys R' Us and other stores I accumulated several dozens of them. Anytime I went with my parents to a big department store, I looked for the Atari games. It was a great thing! Kids today are missing out on so much that we had in the 1970s! I remember when the console units for Space Invaders came out, then Galaxian and Pacman. You stood up while playing them, or sat down with a coaster and a drink for the tabletop video game units. When I was young, pinball machines were everywhere, and video games hadn't been invented yet. I loved playing pinball machines. I was there when the video games all started, beginning with Space Invaders, and it was a grand time to be a kid. You don't see the arcade consoles anymore. We've lost something great in our culture! Here are 19 classic Atari and Nintendo video games of the past. Enjoy! You can download the games to your computer by right mouse-clicking. If you have any difficulty playing these games online, downloading them to your own computer will eliminate bandwidth delays and they'll play faster. They're not that large in file size, smaller than a typical MP3 song. These are Flash media player files, a free program download if you don't already have the program (you probably do). Just click below and start enjoying! 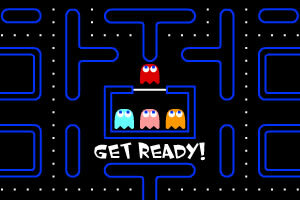 I warn you, Pacman is addictive! Great stuff! Video Games Files to Your Own Computer! Internet Explorer. It may ask you for permission to run script or enable ActiveX Controls. Give permission and the game should play! It does on my computer.